As 2014 fades into the past, why not remember the year with some memes? Make a Meme can be played just about anywhere as long as you have some good pictures. 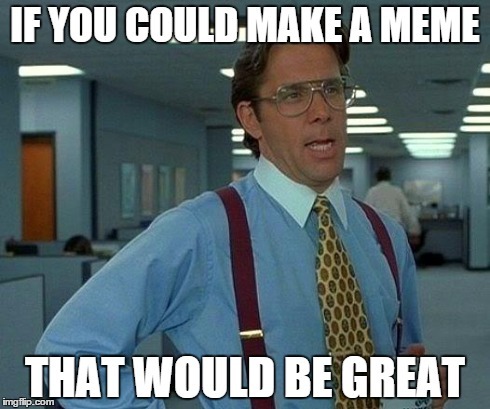 Make a Meme is great way for your group to show off their creativity and wit, all while having some fun. Enjoy this game as you ring in the new year! Select ten pictures that everyone will use as their base. These should include a few from your group and a few pop culture images as well. Make sure they are all from the year you are playing. From there, the group will select 3-5 (will vary based upon time available) to write out a funny caption to finish out their meme. Once time is up, teams will turn in their meme the three judges will select the top memes (top 3 or top 10, depending on size of group). Show and read them to the group and enjoy the hilarity that is sure to ensue! 1. If you have the capability, show the images you have while read the meme. It will add to the effect. 2. Lay out some parameters on what is acceptable and what is not for your group. 3. Post the best memes on your Facebook page or Instagram account. Why not share the laughter with everyone? 4. Award a prize to the group with the best meme. This will help stir their creativity!